Charles de Nevel proposes you some shirts bi-stretch, for woman , élégant and comfortable with a spécific design. Lady's shirt, shorts sleeves shirt, 97% cotton, 3% elastanne . shirt with customised snaps . logo cdn embroidered on chest . . Machine washable 30°. Lady's shirt, sleeveless shirt, 97% cotton, 3% elastanne . shirt with customised snaps . logo cdn embroidered on chest . collar with velcro.Machine washable 30°. 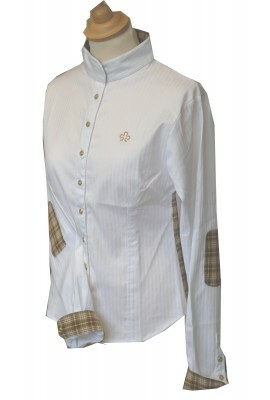 Lady's shirt, long sleeves shirt, 97% cotton, 3% elastanne . shirt with customised snaps . logo cdn embroidered on chest . Machine washable 30°. Lady's shirt, sleeveless shirt, 97% cotton, 3% elastanne . shirt with customised snaps . logo cdn embroidered on chest . contrasting checks , collar lining and side bust . Machine washable 30°. 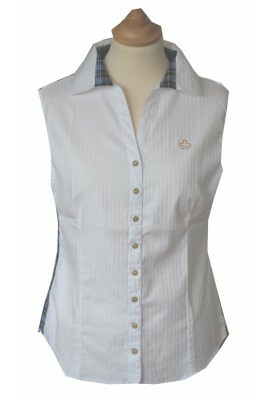 Lady's shirt, sleeveless shirt, 97% cotton, 3% elastanne . shirt with customised snaps . logo cdn embroidered on chest . Machine washable 30°.